SINGAPORE and EATONTOWN, N.J., USA, April 9, 2019 - H2 Cable and SubCom today announced that they signed the contract for the supply and installation of the H2 submarine cable system. The cable will be the first to connect Australia and Hong Kong with direct access to China. The cable design also allows for a number of branching units that can be deployed to locations including Taiwan, Papua New Guinea, Solomon Island, Guam, Queensland, Hawaii and Los Angeles. H2 Cable, headquartered in Singapore, is the owner and developer of the H2 submarine cable system, linking Australia to Hong-Kong (North segment) and the US (East segment). 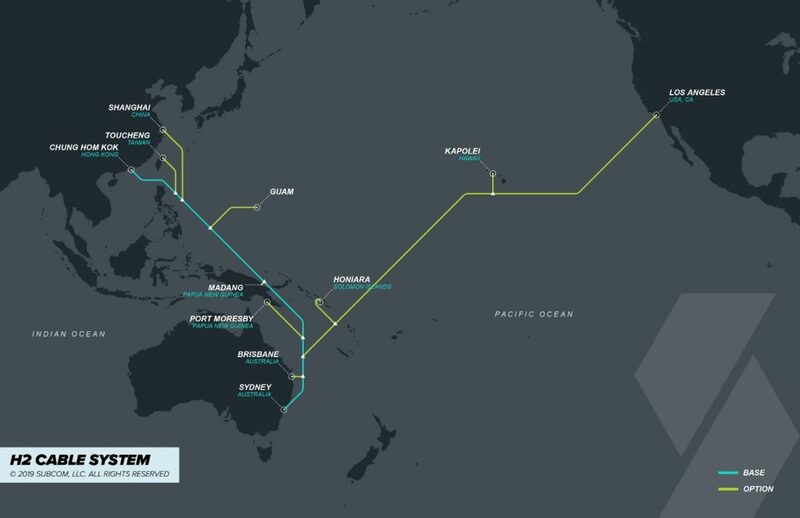 The cable charts new and direct routes throughout the Pacific Region and is the first to connect Australia to Hong Kong with direct links to China. Its design supports branching units linking Taiwan, Papua New Guinea, The Solomon Islands, Guam, Queensland, Hawaii and Los Angeles. H2 Cable will deliver the best latency from Australia across the Pacific Ocean, with the Sydney to Hong Kong branch carrying 15 Tbps per fiber pair and the Sydney to Los Angeles branch carrying more than 12.9 Tbps per fiber pair. The cable has a single-end power feeding capability of more than 13,000 km.